No need to hassle with checks or cash. No need to share bank account information because you enter it directly into the Online Giving secure site. 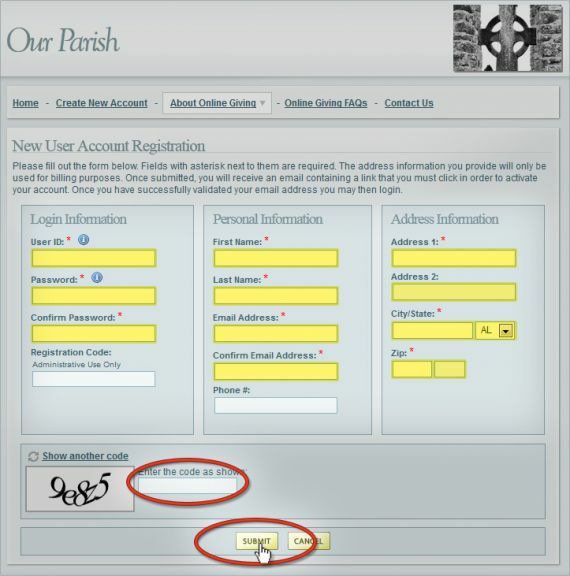 Allows you to give even if you are unable to attend parish services. The User ID must be 6-12 characters and contain both letters and numbers (such as smith78). The password you choose must be 8-16 characters and contain letters, numbers, and at least one symbol such as !, @, &, or *. Do not enter information for the Registration Code, as this is for account administrators only. The e-mail address must be unique. You cannot use the same e-mail address for two different User IDs. Be sure to enter information in all boxes marked with a red asterisk (*); they are also highlighted in the example below for your reference. 3. Confirm Your New Account. Open the e-mail that confirms your account and click on the link at the top of the e-mail. This will confirm your account so that you have access to log in. If the link does not work, copy and paste it into the browser’s address bar. You will need to enter information for the bank account you wish to use for your donations. Once that information is entered, you can then set up donations for the Sunday Collection and other funds listed on the site.